Engagements and marriages are great and joyous events for the Roma, signifying the extension and continuation of the family. For this reason, they are accompanied by great celebrations. Marriage signifies a change in position of the married couple in Roma society as full and productive members of the community. All Roma are expected to marry. The customs and rituals for engagements and marriages described here are traditional and vary for the many Roma tribes around the world. In spite of myths of Roma immorality, most Roma follow strict rules of sexual behavior. He or she is expected to marry someone within their particular tribe and most Roma conform by marrying within their group. 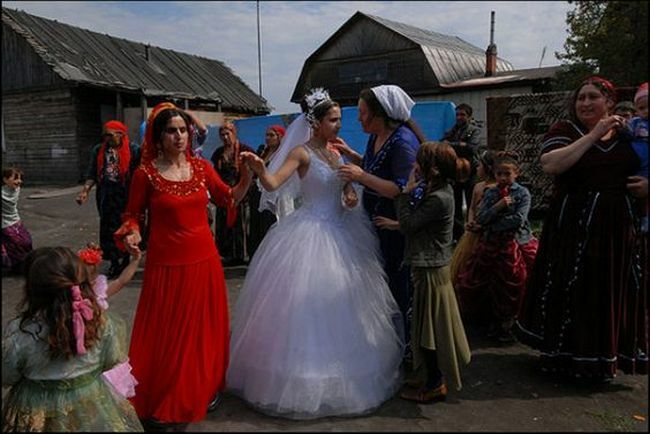 Even with respect to other Roma, permissible marriage choices may be restricted. This is a way of maintaining tribal and social purity. 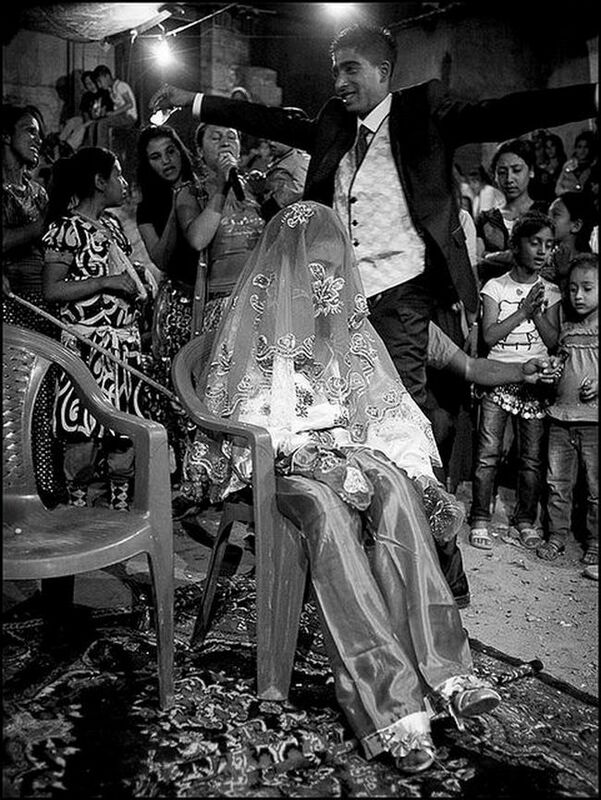 If a Roma male marries a gadji, his community may eventually accept her, provided that she adopts the Romani way of life. But it is a worse violation of the marimé code for a Roma female to marry a gadjo, because Roma women are the guarantors for the survival of the population. In the case of a mixed marriage, many tribes consider the children Roma only if the father is Roma. Roma expect females to be virgins when they marry and to remain faithful to their husbands until death. The potential for defilement is greatly heightened at marriage because Roma perceive it as the end of a woman’s innocence. 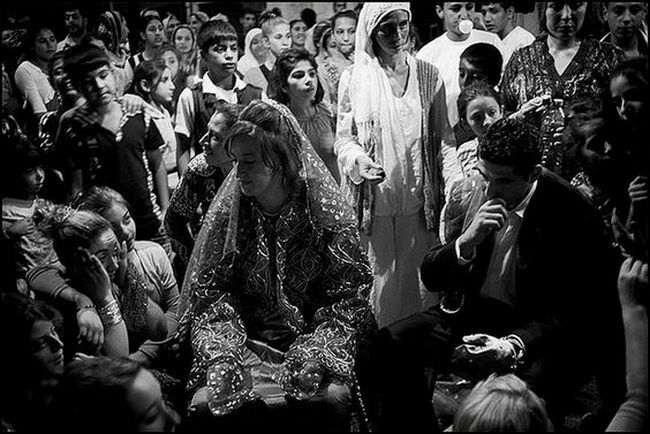 Traditionally, marriages for Roma have occurred early, after age nine but usually before age fourteen. Gajikane influence has undermined this tradition in many countries. The first step in contemplating marriage is the selection of the bride. In many parts of the world, this is done just as it would be done in non-Roma society. The boy does the courting, and when the young couple agree to marry they become engaged and exchange modest gifts. Parents are consulted, but the decision is made by the young people. Many Roma tribes still maintain the institution of bride price. This is a payment made by the family of the groom to the family of the bride. It compensates them for the loss of a daughter and guarantees that she will be treated well. Because of integration into non-Roma societies, many young couples have opposed arranged engagements and marriages and have eloped. Elopement consists simply of the couple leaving together for a period of time. When they return they are chastised and sometimes pay a nominal fine. They usually are accepted as a married couple in time. 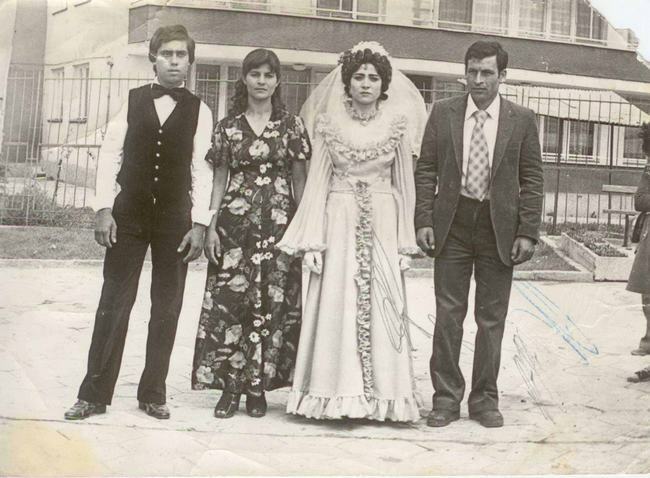 The family plays an active part in marriage formalities that, to non-Roma eyes, may seem lengthy and elaborate. First, there are prolonged discussions between the parents, particularly over the amount of the darro, or dowry. This is a sum meant to compensate for the potential earning power of the bori, or daughter-in-law, who has been taken from her family to join that of her new in-laws. Physical appearance is least important in selecting a bride. The prospective brides are judged on their merits, such as health, stamina, strength, dispositions, manners, and domestic skills. The character of the girl’s family, as well as their prestige in the community, is also taken into account. In these cases, no courtship is involved. It is possible that the prospective couple will hardly know each other before they marry. They will usually send a third, uninvolved person to hear out the girl’s parents on the acceptability of the young man. Rejection of a formal proposal is considered a disgrace. If all goes well, the father of the boy then calls on the father of the girl. It is a polite and rather serious meeting. The purpose is to obtain the formal consent of the girl’s father, and to establish a price to be paid for the bride. This money is to compensate the father for the loss of his daughter, and not as the purchase of a bride. The discussion can be a long one, centering on the estimated value of the future bride. All the future bride’s desired qualities are taken into consideration. In addition, the girl’s father calculates how much his daughter has cost him since birth, since he is in effect giving her away. His money and training have helped make her what she is. At these meetings, the discussions can become quite serious. Sometimes it is necessary to call in friends as witnesses to the bride’s good qualities. They may argue for a higher price on her behalf, or to call in other friends to mediate. When an agreement is reached, and the bride price is accepted, the meeting ends with the father of the future bride drinking a symbolic glass of wine. This means that the boy has been formally approved as a husband for his daughter, under the agreed conditions. Following the formal agreement of terms, there is often a banquet, complete with music, singing, and dancing. The bride-to-be and her family often feign great sorrow at having to leave each other. The groom’s family may complain about the high bride price they had to pay. In the end, they decide that the price is fair for a bride who will be a good wife to their son. Frequently, a few days after the agreement has been made, a ceremony called a pliashka, or plotchka, is held. This event is attended by both friends and relatives of the couple. The symbol of this joyous celebration is a bottle of wine or brandy wrapped in a brightly colored silk handkerchief, brought to the ceremony by the young man’s father. A necklace of gold coins is traditionally attached to the bottle. The groom-to-be’s father takes the necklace of coins and puts it around the future bride’s neck, and warmly embraces his future daughter-in-law, or bori. The necklace makes it clear to all that the girl is now engaged and not available as a bride to any other man. The groom-to-be’s father drinks from the bottle and passes it around to the guests. When the bottle is emptied, it is refilled with wine or brandy for use at the wedding celebration. The wedding itself, called the abiav, is largely a symbolic act, with no religious significance. Though Roma conform to local laws and customs in the countries in which they marry, the non-Roma religious or civil ceremonies are formalities for them. The mere fact that two people have agreed to live together and share their lives together constitutes marriage, and no formal ritual is required. This does not mean that they do not take marriage seriously. They simply do not believe in the importance of a formal wedding ceremony under the jurisdiction of a church or a state. Ordinary civil and religious marriages are becoming more frequent, if only to round off a traditional ceremony. There are traditional but simple wedding ceremonies performed by some groups of Roma. In some marriages, the bride and groom will join hands in front of the chief of a tribe, or an elder of that tribe, and promise to be true to each other. A few Roma wedding rites are centered on bread. In one rite, the bride and groom each take a piece of bread and place a drop of their blood on the bread. They then exchange and eat each other’s bread. In another ritual, the young couple sit down, surrounded by relatives and friends. A small amount of salt and bread is then placed on the knees of the bride. The groom takes some of the bread, puts salt on it, and eats it. The bride does the same. The union of salt and bread symbolizes a harmonious future together for the groom and bride. The informal, joyous festivities celebrating the marriage can go on for several days. A huge feast is served on these happy occasions. There is sometimes an open fire over which whole pigs, sides of beef, game, chicken, or goose are roasted. If it is available, hedgehog may be served, although this traditional dish has fallen from favor in recent times. There might be huge platters of fried potatoes and boiled cabbage stuffed with rice and chopped meat, with herbs and garlic. Drink, too, is served as generously. Musicians play traditional rhythmic tunes and there are songs and dances. Wedding gifts almost always consist of money. Some families may save much of their money to present as gifts at weddings. These money gifts will help the new couple start their new lives together somewhat financially secure. When the celebration has ended, it is time for the groom to take his bride to his home. The bride’s family kisses the girl and they weep as they unbraid her hair, a symbol for her new marital status. Her new mother-in-law helps the bride knot her diklo, or head scarf, a sign that she is a married woman. She is never seen again without this diklo in public. The celebrations ended, a new life begins for the couple. They now take their places as full members of the community. The major change for the man is that he is now socially accepted by other married men. Changes for the woman are more radical, for it is she who leaves her family, gathers her personal belongings, and moves in with her husband’s family. She is guided by her new mother-in-law and expected to take an active role in the household. Not until the birth of their first child, and sometimes not until the birth of several children, will the couple move into their own home. Not until they are parents, too, will they be able to refer to each other as husband and wife. Before then, they use only their first names with each other or in speaking about each other. 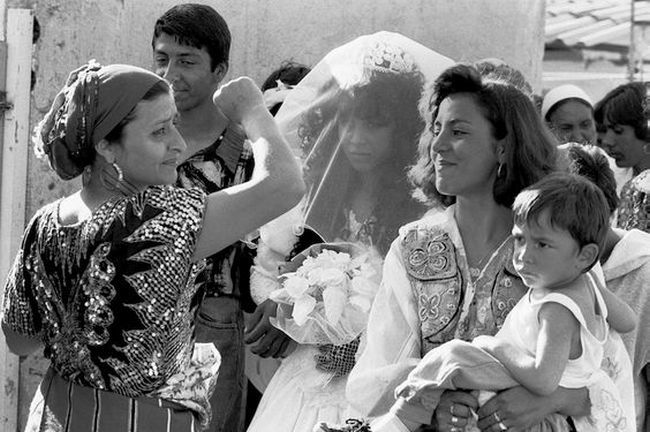 Marriages among Roma are serious commitments, and there are strict obligations on both sides. If a girl is found guilty of adultery, she must be taken back by her parents, who, in addition, must return the bride price to the husband’s father. Infidelity in marriage historically has had serious consequences for the wife, including corporal punishment or a sentence of marimé. If the girl’s father feels she has been mistreated by her husband or her in-laws, he has the right to take her away. In many cases, these complaints are heard before the kris before a final settlement is made.